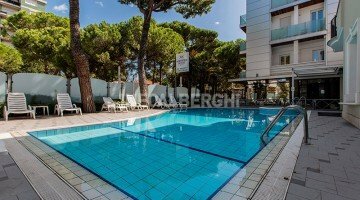 The 3-star Hotel Adriatica in Riccione is located in the central area, offering well-appointed rooms and services for the whole family: swimming pool with Jacuzzi and children's area, garden, parking and WI-FI. Organize excursions and sailing trips. Accepts small pets. 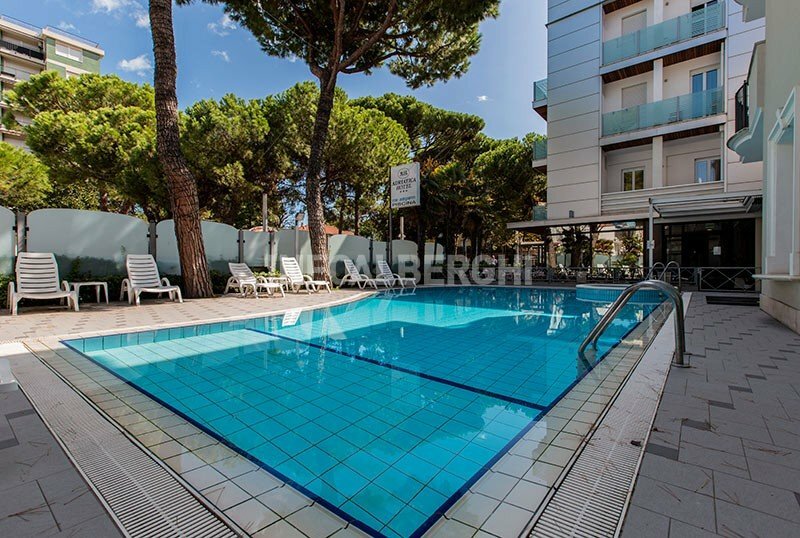 The hotel is located in Riccione in the central area: in the pedestrian area of viale Dante, 3 minutes walk from the Palazzo dei Congressi, the beach and Viale Ceccarini. The train station can also be reached on foot, which is less than 15 minutes away. Each room has a 32 "TV, safe, bathroom with shower box, hairdryer, individually controlled air conditioning and WI-FI connection.The minibar is available in the Top Quality rooms and a balcony is available on request. FAMILIES: large family rooms and connecting rooms are available. The hotel has a large swimming pool, jacuzzi, garden, outdoor open-air porch, free bikes, reading room, elevator, beach towel available, night porter and laundry service outside. Organize parties with music in the garden. PARKING: for a fee, discovered in the hotel (7 seats) or 24 seats at 400 m.
WI-FI : free connection throughout the entire hotel. CONVENTIONS: equipped beach, amusement parks, free shuttle service, excursions and sailing boat trips. BREAKFAST: buffet set up on the open-air porch by the pool with sweet and savory products, hot drinks, fruit juices, jams, bread and homemade desserts. LUNCH AND DINNER: traditional dishes of Romagna and Mediterranean in 3 menus to choose from including one of fish, with vegetables, appetizers and side dishes buffet. In hotel: strollers, swimming pool for children. Upon request: baby sitter and pediatrician service. At the restaurant: baby food, baby menu, high chairs, kitchenette for mothers, bottle warmers. The hotel has a large swimming pool with a children's pool and hydromassage, surrounded by a sunbathing area with loungers. The hotel has an agreement with the Bagno n. 85.